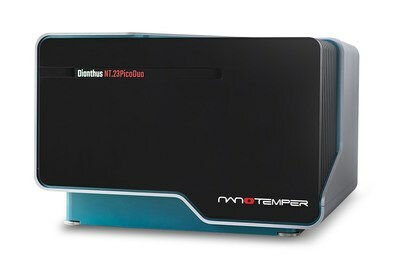 SOUTH SAN FRANCISCO, Calif., Jan. 31, 2019 /PRNewswire/ -- NanoTemper Technologies, maker of life science tools for protein characterization, launches its newest system, Dianthus, at the Society for Laboratory Automation and Screening (SLAS2019) conference in Washington, DC. Built to address the demands of drug discovery screening, Dianthus removes the complexity of binding interaction measurements and enables scientists to develop new drugs for every target faster and at lower costs. "Speed is a huge advantage and Dianthus is really fast, screening 10,000 compounds per day, which is unmatched in biophysical drug discovery," says Amit Gupta, Product Manager at NanoTemper. "That's only possible because it's very hands-off, with no fluidics so there's no cleaning or rinsing and virtually no downtime. It also uses industry-standard SBS microplates so it easily integrates into a variety of automation workflows." Dianthus was inspired by our customer's feedback and was built because they demand fast, non-stop, highly sensitive hit screening. See why Dianthus is so important to drug discovery screening or visit nanotempertech.com/dianthus to find out more details. For the most up-to-date information, follow NanoTemper and #speedscreening on LinkedIn, Facebook and Twitter. Our mission at NanoTemper Technologies is to enable everyone to do science that matters by always pushing the limits. We're focused on making biophysical tools accessible to anyone looking to characterize proteins in any industry. Working with customers striving to make a difference in the world gets us excited. If you're looking to measure binding affinity, protein stability or protein quality, let's talk.